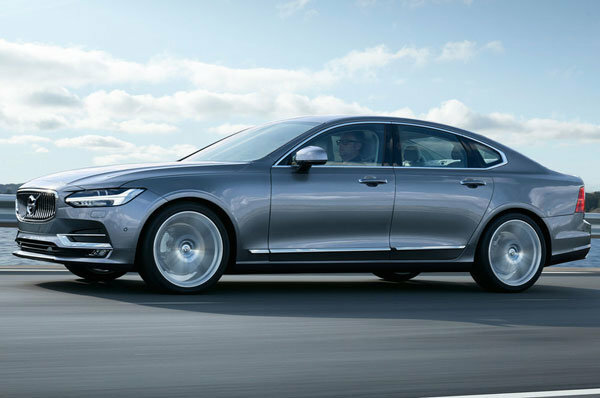 Hot on the heels of the XC90 becoming the 2016 Motor Trend SUV of the Year, the 2017 Volvo S90 was revealed today near the automaker's Gothenburg, Sweden headquarters, offering up luxurious looks, three powertrain choices, and Volvo's latest safety technology. Built on Volvo's new Scalable Product Architecture (SPA) which underpins the XC90, the new 2017 S90's design is heavily influenced by the Concept Coupe. The "Thor's Hammer" LED headlights from the concept and the XC90 provides a familiar face up front, while the S90's profile gets a clean, elegant design with a luxurious-looking dash-to-axle ratio - Volvo's SPA really hides its front-drive roots well. In back, the taillight graphic from the Concept Coupe carries over with few changes to the production S90, with the trunk lid spelling out the Volvo name and detailing which engine can be found under the sedan's hood. Speaking of engines, American buyers will have three different four-cylinder powertrains to choose from when the Volvo S90 hits our shores. The S60 sedan's T5 2.0-litre turbocharged I-4, the XC90's 2.0-litre supercharged and turbocharged I-4 that comes in gas T6 and plug-in hybrid T8 forms. European buyers will likely get diesel powertrains (and a V90 wagon) too. Power outputs have yet to be announced, but the T5 makes 240 hp and 258 lb-ft of torque in the S60, while the T6 and T8 make 316 hp and 295 lb-ft of torque, and 400 hp and 472 lb-ft of torque, respectively. An eight-speed automatic is expected to be standard across the board. All-wheel drive will be available. Inside, the elegant and luxurious interior of the XC90 carries over with little noticeable changes. The interior is a striking mix of high-quality leather, beautiful wood grain, and metal trim. Volvo's Sensus infotainment system takes the place of many buttons you'd otherwise find on the center stack, helping simplify and de-clutter the interior. Given that Volvo's goal of reducing injuries and eliminating fatalities in its vehicles starting 2020 is rapidly approaching, it's a safe guess that the S90 features most, if not all, of the semi-autonomous active safety technology from its crossover brother. Pricing for the 2017 Volvo S90 has yet to be announced, but given the S80 that it replaces starts around $44,500 including destination, $46,500 for a base S90 T5 doesn't seem like too much of a stretch. The Volvo S90 will debut at the 2016 Detroit Auto Show.